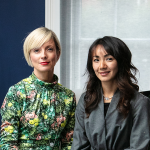 Fuelled by a shared passion for design, Lisa Smyth (left) and Christine McKee (right) established shesaid in 2017 with a vision to provide impactful design and branding solutions for a diverse range of clients and collaborators. Our aim is to enable growth and success for our clients through meaningful design strategies. Christine has over 15 years experience working for top Northern Irish Design agencies.